the adventures of tartanscot™: "That Certain Feeling . . . "
And I know you know what I'm talking about. You've most likely felt it yourself. Spending a lazy Saturday in bed - flipping through inspiration files. Seeing a room. And needing to know more. Not just examining the academic elements it is composed of . . . but, wanting to hear it whisper its secrets. Or maybe I just need to get a bit more sleep . . . lol. from the beautiful work of Jeff Andrews. There is a certain secretive mystery to some rooms. It's intangible, floats a bit in the air. And of course any space with books has an added mystique. I just start following you at Twitter and getting to know your work better and I am loving it! You're brilliant! This room is great. It feels like Fall with those beautiful chairs, the dark wood, the color on the wall. Lovely, really. I just started a blog about interior design. If you can stop by and let me know what you think, it would mean a lot to me. Nothing better than having the luxury of spending a few hours scrutinizing and drooling over beautiful interiors images. My week-end is devoted to the latest book by Vicente Wolf. Have a great lazy week-end. 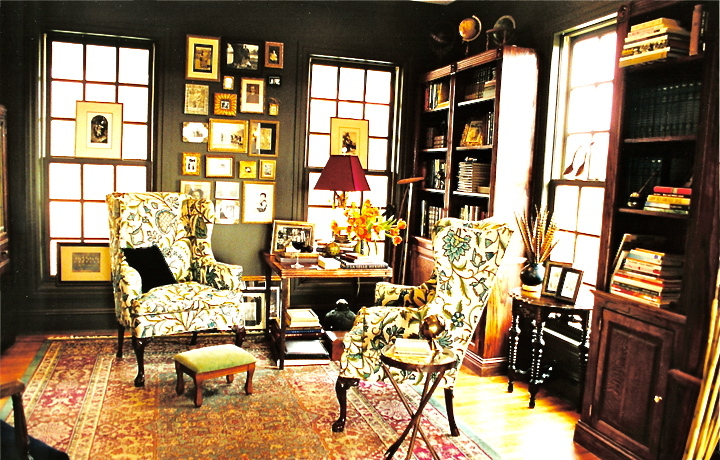 I am always having a thing with dark walls and wing chairs. Thanks for sharing. Classic yet fresh. And every room has secrets! No, you don't need more sleep. I know PRECISELY to what you are referring! I get that same feeling whenever I visit you here! Happy Fall! Indeed magnificient; not only the beautiful light "fall-room"...but also the thoughts!! Fall is waving it's magical wand of nesting, napping, and being at peace within a safe place. Enjoy! This is just the right inspiration photo for my library. Thanks! Scot I know you will love my new giveaway from Metis Linens! !